One of my favorite necklace projects is what I called “Crystal Veil.” It’s basically just a pendant on a chain. The “pendant” and focal point of the piece is a series of simple-loop dangles hanging from a horizontal 20-gauge wire. The horizontal wire is looped at both ends and attached to chains that come together in a J-clasp. 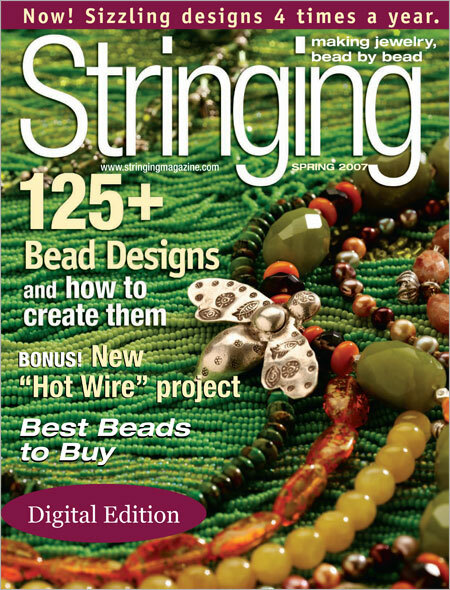 Crystal Veil is one of the simplest concepts I came up with, but still made its way to Stringing Magazine’s Spring 2007 issue. 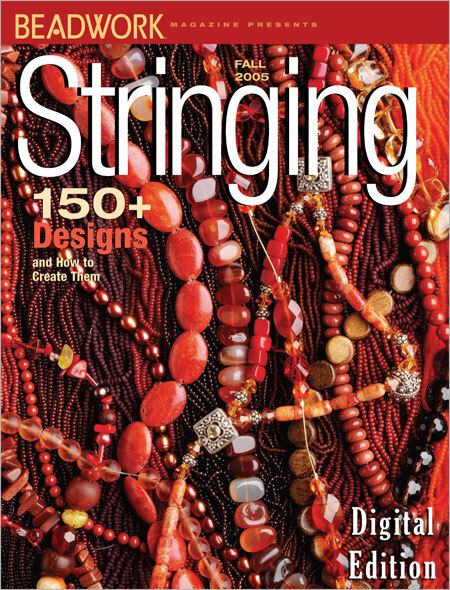 It was also featured in the Best of Stringing 2009, in the Fun with Focals section. Like they say, less is more. I gaze at wonderful awe-inspiring jewelry by fellow designers, and I can’t help thinking those complex and artful designs must have started out as mathematical equations. I’m not a metal smith and I don’t make my own beads, so I’m basically a stringer of beads. My art is in how I arrange and sequence the beads in one or more strands that come together at a clasp. Sometimes I start with a color scheme, a combination of gemstones, or a focal piece. Other times, when I’m not doing a commissioned piece, I let the beads dictate the design. For example, here are photos of bracelets I designed some years ago (the photos were taken with an old point-and-shoot camera). These are straight stringing designs, only because the beads are great as they are. No need for fancy combinations with other beads, no complex or tedious compositions, constructions, or algorithms. Other designers might say straight stringing is plain, boring, and too easy, but I think we can take the simple road every now and then and let the beads speak for themselves. I am so thrilled! Stringing Fall 2010 is out! And my Fertile Ground necklace is on page 34! I had submitted this set to Stringing back in November. The magazine included the bracelet and earrings in the Summer issue and featured the necklace for Fall. Designing this necklace was kind of a no-brainer to me. 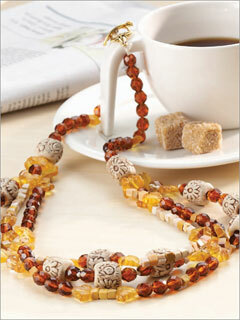 With the flower ceramic barrels as the focal beads, it just made sense to use pressed glass leaves in amber-gold. Rich brown fire-polished glass and mookaite cubes added to the earthy feel. And to make it more natural, I used waxed linen cord for stringing. Unrefined. Autumn. NEWSFLASH! To coincide with the release of Stringing Fall, our fellow designer, Michelle Mach, organized a blog carnival. And she’s giving away prizes! The rules for the drawing are on Michelle’s blog: www.michellemach.com/blog/. 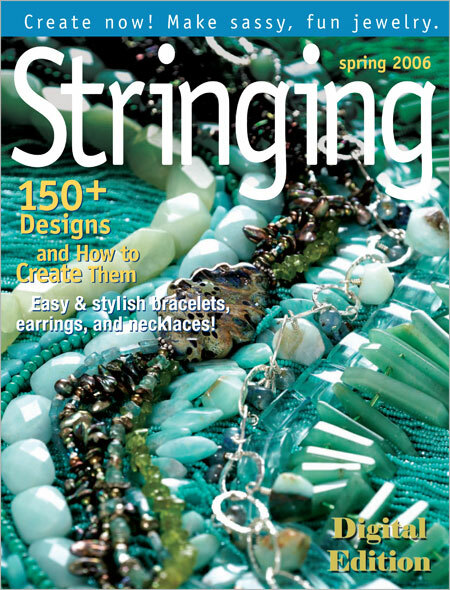 She has three great prizes: a copy of the Fall issue of Stringing magazine, a handmade porcelain pendant and coordinating beads by Gaea, and a small goodie pack of filigree, gemstones & other findings from Rings & Things. Basically, leave one comment on one or more of the blogs and you will be entered into the random drawing. Each comment on a different designer’s page is another chance to win. (Multiple comments on a single designer’s page counts only as one chance to win.) Giveaway closes on the 23rd and winners will be announced the 24th. 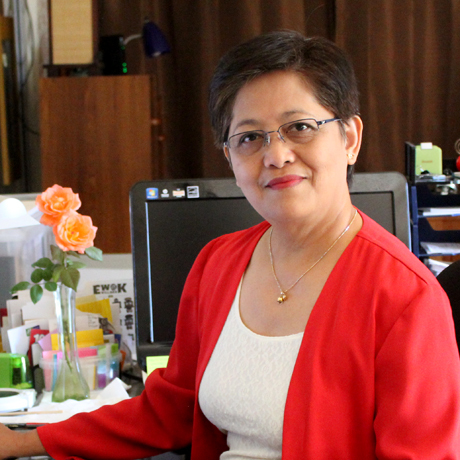 So, don’t waste time… visit the blogs of these Stringing contributors now! And don’t forget to leave a comment for a chance to win a prize! My brother sent me this stretchy bracelet many years ago, part of a huge stash of assorted beads I’ve since used in countless projects. I could’ve repurposed the beads but until now the bracelet remains intact, and yes, the two neon beads still glow in the dark. I took the opportunity to study the features of my relatively new DSLR along with the layer functions of Photoshop Elements 8 by shooting this bracelet. After a few trials and errors and a number of “Oh look!” moments, I settled on this composition. Ah, beading and photography. I reinvent myself almost everyday. BTW, I haven’t been looking around, but are there more glow-in-the-dark beads like these out there? A few months after I started beading, I decided to make a “Favorites” charm bracelet. I made the 14K gold-filled chain links myself and I looked forward to attaching charms through the years. The charms are representative beads from creations that mean a lot to me. Each charm is attached to a special story or a fond memory. I look at a charm and a stream of good feelings play in my head. This reminds me, I have a few charms waiting to be added to the chain, a few more stories to include in my bracelet of memories. I’m thinking maybe many years into the future, I will have constructed a dense and colorful charm bracelet with never-ending stories to pass on to new beaders starting out their own chain of fond memories. This Golden Pond set has a weird story. I had designed five bridesmaid sets for the Star Wars Wedding bridal jewelry with plenty of time to spare. The bride approved the designs four months before the big day. I had planned to make more and give the bride more options for her bridesmaids, but then I got busy designing her necklace. I don’t know what possessed me but when the online submission deadline for Stringing came up, I emailed the photos of the bridesmaid sets. The editors wanted me to send them two of the five. Uh-oh. Realizing my folly (I had no time to make more designs, and if I ship the pieces out, I won’t get them back in time for the wedding), I held on to one and made a similar design of the Golden Pond set. The one I sent to Stringing had synthetic rice pearls; the one I brought to the wedding had freshwater potato pearls. 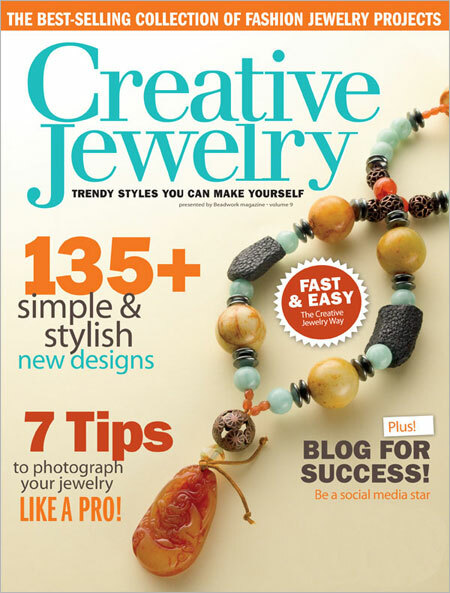 The Stringing editors got back to me saying they won’t use Golden Pond on their coming issues but their sister publication, Creative Jewelry, wants to include the necklace and earrings in their 2010 magazine. So, my Golden Pond design appeared in the Star Wars Wedding in Manila in February, as well as in Creative Jewelry 2010 in July. All’s well that ends well, but I’d say my lesson there is to trust my designs. I must have sent the bridesmaid jewelry photos to Stringing assuming they won’t pick any and I’d be all good for the wedding. What was I thinking? I discovered these ceramic barrel beads at a Black Market Minerals store. They’re very interesting because they’re beige and brown like clay, hand-etched with almost indistinguishable geometric shapes, ethnic symbols, and assorted artistic markings. A couple of strands stood out because they had flower markings. I like flowers. I bought a strand. The barrel beads are a little bulky, so the accompanying beads can’t be too delicate. Besides, the holes are big, so even the stringing element should be sturdy. I decided to use 20-gauge sterling silver half-hard wires. To hold the barrels in place, I put each of them between a pair of faceted fire-polished glass beads, also brownish in color. The matching earrings were easy — a couple of headpins, bicone crystals to hold the barrels in place, and dark brown accent beads embellished with bead caps. I wore the bracelet for a few minutes. That’s how I determine if it’s good, not only to the eyes but also to the wrist. I found out that I wouldn’t wear it with my writer hat (those humungous beads misaligned my typing). But yes, I’ll proudly wear the bracelet (and the heavy earrings) to a summer picnic. Just because you can’t wear a piece of jewelry everyday, doesn’t mean you shouldn’t own it. 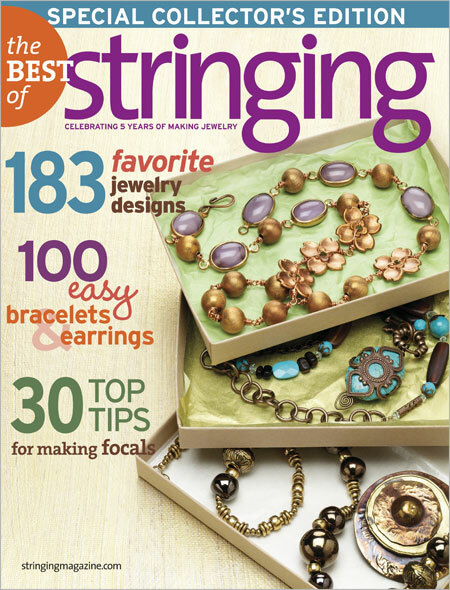 The Flower Barrels bracelet and earrings were published in Stringing Summer 2010. 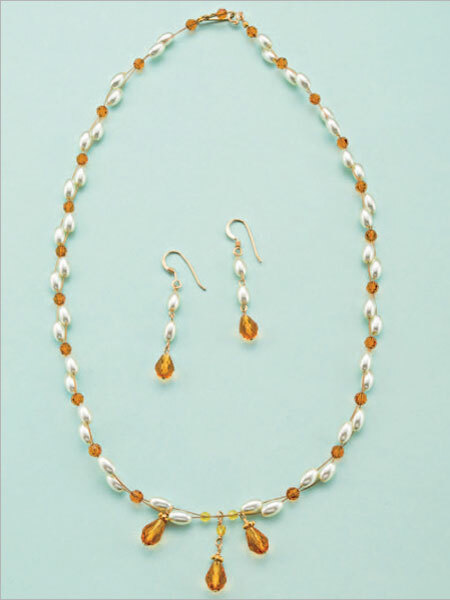 The matching necklace was featured in Stringing Fall 2010.